All the spells like Jaina! I've got the moves like Jaina! Oooo, I've got spells like Jaina! Peaking in the door you see a pale gawky human, in the bright purple robes of a beginner, dancing awkwardly on her bed and singing. With them moves like Jaina! I've got the spells like Jaina! 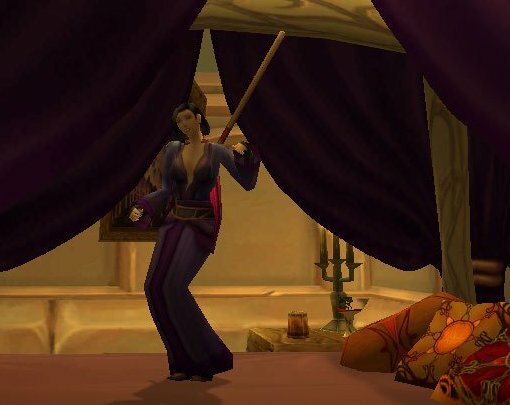 Oooo, I've got moves like Jaina! She gasps and hides behind the curtains of her four-poster bed, as she sees you watching her. I was going to comment but I don't want to spook her, enjoyed peaking in.